ß-adrenergic receptors (ßARs) are powerful regu- lators of cardiac function in vivo, activating heterotrimeric G proteins and the effector molecule adenylyl cyclase (AC). Interestingly, cardiac-specific overexpression of different AC isoforms leads to variable changes in cardiac function. Whether AC overexpression affects intrinsic cardiac contractility in an isoform-specific fashion determining a change in exercise capacity is currently unknown. To address this issue, we performed load-independent measurements of cardiac systolic and diastolic function by pressure–volume (PV) loop analysis in intact wild-type mice (WT) and transgenic mice overexpressing the AC isoforms 5 or 8. 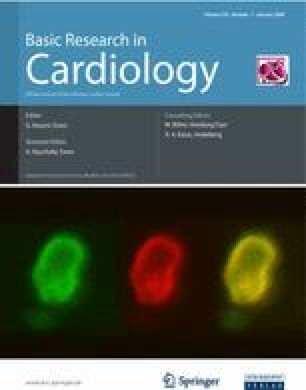 Here we show that cardiac overexpression of either AC5 or AC8 transgenic mice determined an increase in intrinsic cardiac contractility. Interestingly, AC8 transgenic mice displayed a significantly greater increase in cardiac contractility and improved active phase of relaxation. Despite these differences detected by PV loop analysis, both AC5 and AC8 mice showed a marked increase in exercise capacity on treadmill testing. Our results demonstrate that load-independent measurements of cardiac function are needed to compare different groups of genetically-modified mouse models and to detect subtle AC isoform-specific changes in cardiac performance. Giovanni Esposito and Cinzia Perrino equally contributed to this work. This work was supported, in part, by grant HL56687 (NIH) to Howard A. Rockman and by grant PRIN2005 by Ministero dellUniversità e della Ricerca Scientifica to Massimo Chiariello.